In a recent project we worked on, we needed to add a custom log which also had to identify which exactly remap rule triggered. I think this is probably a worthwhile feature to add to ATS (see https://issues.apache.org/jira/browse/TS-2181), but there's an easy way using existing plugins to accomplish this. Using (for example) the header_filter.so standard plugin, you can setup a config for each remap rule that you wish to identify. Voila! The trick here is that headers with the @ prefix are considered internal to ATS, and are removed before sending to servers or User-Agents. Assign URLs to specific storage units. We follow strict Semantic Versioning, ever release within a major version is guaranteed to be API, ABI, cache and functionally backward compatible. We will produce minor releases on a strict quarterly schedule: May, August, November and February. The Git master branch is intended to be kept stable and releasable at all times. This implies that master can be seen as the daily current development release, and there are no more official development releases. 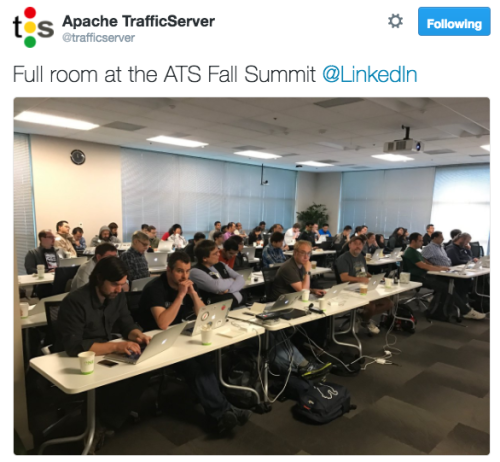 On the behalf of the entire Apache Traffic Server community, we hope you find this release to be useful and rock solid! The Squid log format that we have by default in Traffic Server is a standard format that works well for proxies. It's also well supported by existing log analyzers etc. However, in some cases, where you map many domains to one origin server, the logs produced aren't particularly useful. Why? Because the default Squid log format logs the remapped URL, and not the original client URL. There is of course an easy way to fix this, using our custom log formats. Disable the original Squid log format, and enable the custom logs. Thanks to Go Daddy switching from IIS to Apache Traffic Server (good choice!) we're now at around 4.2% market share according to Netscraft's latest survey. We're combined with Apache in general, so we helped Apache gain one of the largest market share increases in recent history. The study is available at http://news.netcraft.com/archives/2013/05/03/may-2013-web-server-survey.html.